Three of embattled Vice President Emmerson Mnangagwa’s most vociferous supporters have been arrested on allegations of inciting public violence and attacking President Robert Mugabe, his powerful wife Grace, and other senior government officials. The trio – Godfrey Tsenengamu, 33; Godwin Gomwe, 37; and Vengai Musengi, 36 – are part of a tight 14-member youth group that was summarily expelled from the warring Zanu-PF last Thursday, as the ruling party’s factional and succession wars continue to escalate. And before the ink on the letters formalising their expulsion from the former liberation movement has dried up, the youth leaders have now been dragged to court, where they appeared before Harare magistrate Vakayi Chikwekwe yesterday. The trio stand accused of holding a media conference at New Ambassador Hotel in Harare on February 16 this year, two days before a scheduled war veterans meeting, with the alleged intention of inciting the liberation fighters to commit acts of public violence. “The accused sent WhatsApp messages mobilising youths and war veterans inciting them to join them in what they termed the ‘Save Zanu-PF Campaign’, which is a group formed to verbally attack the president of the Republic of Zimbabwe and other top government officials,” the State alleges. It is further alleged that in pursuit of their agenda, the three men attended the war veterans’ intended City Sports Centre meeting of February 18, where they reportedly shouted, “Let’s start a war” – and allegedly going on to tear and burn T-shirts inscribed “Vanhu vose kuna amai (everyone should follow Grace)”. Prosecutor Peter Kachirika said the trio’s actions were meant to provoke Grace and her supporters, adding that, at any event, the meeting that they attended was meant for war veterans and not the youths. However, the planned war veterans meeting flopped after it was thwarted by police, who teargased and dispersed them using water cannons. The arrest of the three men also comes following damaging weekend claims that they wrote a letter to Mugabe accusing the nonagenarian of using divide and rule tactics to remain in power. In their letter, they also allegedly accused Mugabe of using them to hound former Vice President Joice Mujuru out of Zanu-PF in 2014, following untested allegations that she wanted to oust from power and assassinate the long-ruling nonagenarian. 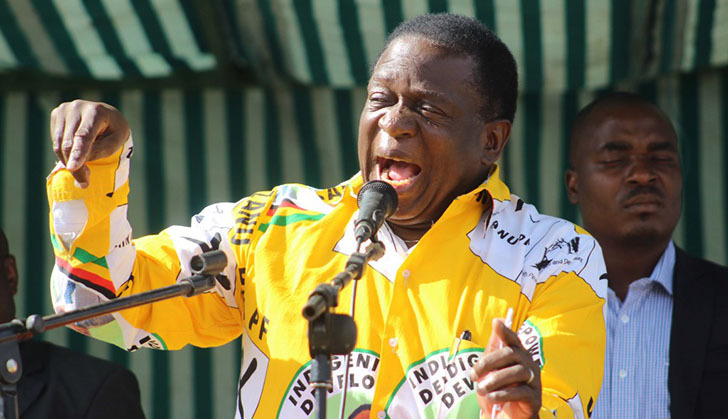 About two dozen Zanu-PF bigwigs linked to Mnangagwa, including former War Veterans minister Christopher Mutsvangwa and his wife Monica, were booted out of the ruling party last week. Zanu-PF insiders who spoke to the Daily News then, after the party’s politburo announced that latest carnage to hit Team Lacoste (Mnangagwa’s faction), said it was “all over bar the shouting” for the beleaguered camp in its wilting quest to get the Midlands godfather to succeed Mugabe. In addition to suspending the garrulous Mutsvangwa and his wife from the party for three years, the former liberation movement also summarily expelled from within its ranks 14 youth leaders – including Gomwe, Tsenengamu, Musengi and Edmore Samambwa. “It’s all over bar the shouting. Team Lacoste is now dead and buried,” a senior party official linked to Zanu-PF’s ambitious Young Turks known as the Generation 40 (G40) group said. Addressing the media just after the politburo had met and dealt with scores of disciplinary cases that had been brought before it by the party’s national disciplinary committee, spokesperson Simon Khaya Moyo revealed that more than 20 officials had been banished from the former liberation movement. “All in all, nine cases were presented and extensively discussed by the politburo. Three people were suspended for three years. “I will start with Mashonaland West where Chris Mutsvangwa (pictured) has been suspended and therefore must not hold any position in the party for the same period, but remains a member of the party and a Member of Parliament. “In Midlands, Espinah Nhari also lost her position in the women’s league. She was secretary for administration and also has been suspended for three years. “Monica Mutsvangwa lost her position in the women’s league and is suspended for three years. We also have Rosewita Chinyaure, I’m not sure of her province, who has been expelled from the party. Another one expelled is Taurai Pasirayi,” Khaya Moyo said. While Mnangagwa did not attend the meeting to witness the brutal demolition job on his support base first hand, as he was said to be out of the country, his protégé, Mutsvangwa – who has been a member of the politburo – immediately left the meeting in disgust after his suspension was announced. He has since been fired from Cabinet. “Seven provincial youth chairmen were expelled from the party for gross indiscipline and misconduct and these are Godfrey Tsenengamu (Mashonaland Central), Godwin Gomwe (Harare province), Vengai Musengi (Mashonaland West), Khumbulani Mpofu (Bulawayo), Edmore Samambwa (Midlands), Tamuka Nyoni (Matabeleland North) and Washington Nkomo (Matabeleland South). “Another seven youth leaders representing associations aligned to Zanu-PF have also been expelled from the party for indiscipline and misconduct and these are Tonderai Chidawa (Zicosu), Norest Makururu (Youth in mining organisation), Collen Machingura (youth in farming), Memory Masengu (youth against sanctions), Absalom Mabuse (youth service graduates association), Gabriel Togarepi (Ziliwaco Trust) and Innocent Mhlanga (children of war veterans,” he added. The politburo, Khaya Moyo said, also received a report to the effect that the NDC was still considering the cases of suspended provincial chairpersons, Joel Biggie Matiza (Mashonaland East), Kizito Chivamba (Midlands) and Ezra Chadzamira (Masvingo). “You are aware that there are three provincial chairpersons who are on suspension and we expected a report for them. But the national disciplinary committee told us that it is still to conclude the matter. “Four people were given severe reprimands and these are Tendai Makunde (Murewa North MP), Felix Mhona (Chikomba Central), Washington Musvaire (Maramba-PFungwe) and G Katsande,” Khaya Moyo went further. Mutsvangwa’s political fortunes nose-dived late last year after his home province of Mashonaland West expelled him, as the ruling party’s factional and succession wars continued to worsen. His suspension at the time came just after his wife Monica was also banished from the brawling party’s women’s league, with the power couple standing accused of being close allies of the VP. Among a litany of charges against them were those relating to them allegedly insulting the first family after Mutsvangwa said the party’s national political commissar, Saviour Kasukuwere, was guilty of disrespecting “the institution of marriage and that of the State” – in apparent reference to Kasukuwere’s alleged close political association with powerful First Lady Grace Mugabe. Well-placed Zanu-PF sources told the Daily News last week that it was “a matter of time and not one of if” the three bigwigs – Chivamba, Chadzamira and Matiza – would be booted out of the former liberation movement. “These comrades simply have to go as they have been the source of too many problems in their respective provinces, which the party can no longer tolerate. It’s enough frankly,” one of the sources said. Among the litany of charges that are being flung their way are those related to their alleged “continuing undermining” of Mugabe and Grace, as well as claims that they are fanning factionalism in the governing party.